FamilyConnex™ is NFRC’s signature online program that helps parents create a child-focused parenting agreement based on the needs of each child. Parenting can be a very difficult job and very few people are formally trained to be parents, a role that lasts a lifetime. Most parents do not intend to end relationships with their children’s other parent; however, if it does happen, separation and divorce can be very emotional, stressful and disruptive to all involved, and each member of the family will likely experience it in a different way. Regardless of the difficulty, parents must learn to work together to co-parent, to ensure their children are parented in physically, emotionally, socially and medically healthy ways. 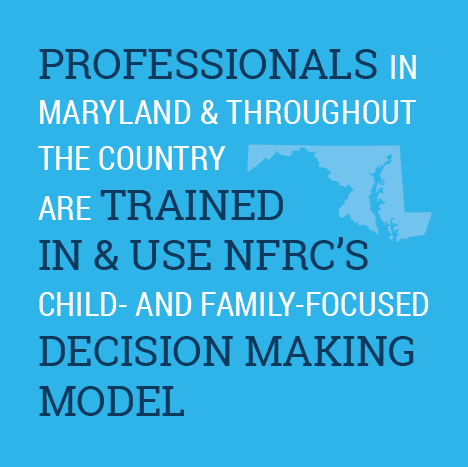 The Child and Family Decision-Making model helps parents move away from their own conflict to address the developmental needs of their children. Describing development from infancy through late adolescence – the model relates these phases to a child’s psychological well-being; ability to learn; ability to make decisions; and to have healthy relationships. With this model, you can learn about the possible impacts of a family transition on each stage of development and what you can do to ensure the healthy progress of your children. The “About My Child” assessment tool helps you focus on your child’s needs as well as your parenting strengths and weaknesses. Most parents find that there is a balance of care that can be achieved between both parents. Once your child’s needs are identified, you can begin to build a parenting plan for both parents with the Parent Plan template in the program. It may not be easy to work with each other, but parents who work together teach their children that their children’s needs come first and that everyone can be treated with dignity and respect. The Parent Manual addresses the challenges and special issues that may arise and is a foundation of good parenting that can be referenced now and in the future. No family is perfect and the Parent Manual can be a continuous reminder of the need to improve and maintain good parenting skills. With FamilyConnex™, both parents identify each child’s needs and define how they will co-parent — providing the foundation for a healthy and collaborative process for everyone. For more information visit: www.familyconnex.org.